Michael: We discovered this restaurant by accident. The decision was made on a warm sunny day to get out of the city. On such a day the traffic going North to escape the concrete jungle would be almost a traffic jam. We took a different route towards the town of La Calera. The hungries hit us, or maybe it was The smell from the parrilla of the restaurants along the way, and the parking lot for Cocina de Colombia beckoned us. There is a sign advertising something about extreme things. But beyond that there is not much to tell you what to expect. However the small structure with a fireplace inside revealed its strengths when we entered. Graciela: The friendliness that Colombians are known for showed immediately. A man dressed in black pants with a white shirt greeted us at the door. Then we received a smile and good afternoon from a lady ready with menus also dressed in the black and white attire. Though they have seating on an outside covered patio we chose an inside table next to the fireplace. The white painted bamboo ceiling contrasted with the dark wood beams created a comfortable feeling. Michael: The menu features appetizers, meats, fish, chicken and soups. And yes they have hamburgers and fries for the little ones. OK my gringo readers, they feature much of the best of typical Colombian food like arepas, empanadas and picadas (a plate of many different meats along with potatoes and plátano). I ordered the baby beef. My wife chose the churrasco. Service was prompt and the food came just the way I like it on a metal plate still sizzling. The main dish also included papa criolla (a potato found almost exclusively in Colombia), a salad and plátano. They brought both a chimichurri and guacamole sauce. How easily the meat cut and the taste told me it was Colombian beef cooked on a parrilla. I have to say that it does not get much better than that. Graciela: The table next to us ordered a plate of patacones to share. On the menu they are called tostón de plátano. That is the Latin American generic name for them. It comes from the Spanish verb of tostar, which means to toast. These are green plátanos (a cousin of the banana) that is fried. A topping is often added. In this case it is cheese on some and hogao. Michael: When we asked if we could take a photo for the article, in typical friendly fashion of Colombians they not only agreed but shared one with us. I have eaten patacón before, but with the toppings these are something I will definitely order next time, and I recommend that all gringos order them as a appetizer for their meal. Graciela: Their drink list is impressive. They offer cold, hot and adult beverages. In keeping with the idea of good for you food they have natural juices. Of course you can also get sodas. Then there is the Colombian specialty of refajo. Coffee, tea and aromaticas are in the hot section. Michael: Adults can choose from national beers to a couple different types of whiskey. But if you really wish to make your dining truly Colombian then order the aguardiente. 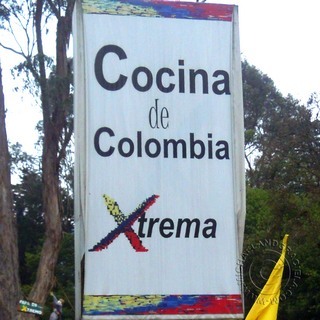 Graciela: It was only when we looked at the menu did we understand what the “Xtreme” on their sign meant. Associated with the restaurant is a place where one can do such things as reverse bungee jumping and paintball. Though the back looks like an interesting walk and view of the activities, we saved that for another day. Michael: If you are looking friendly place to partake of the best Colombian food and drink then Cocina de Colombia should be on your list of restaurants to eat at.